I know I’ve posted pics of this beauty already, but this quilt deserves another post! Tiffany used fabric from my new High Tea Collection for Lecien fabrics which comes out this August 2016. 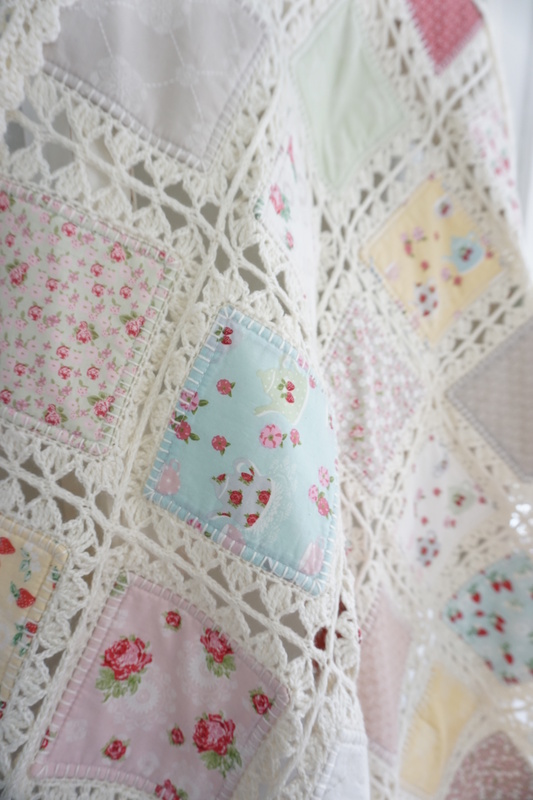 When planning what quilts to make for market, Tiffany knew she wanted to incorporate some kind of lace or crochet look as inspired by my doile rose print. This project was the perfect choice! I love how this quilt is a form of quilt-as-you-go, where instead of joining strips to connect the blocks together, crocheting is used. I hope you all enjoy Tiffany’s tutorial and make something beautiful from it! The link us between the 1st and 2nd pictures. It took me a while to find too! 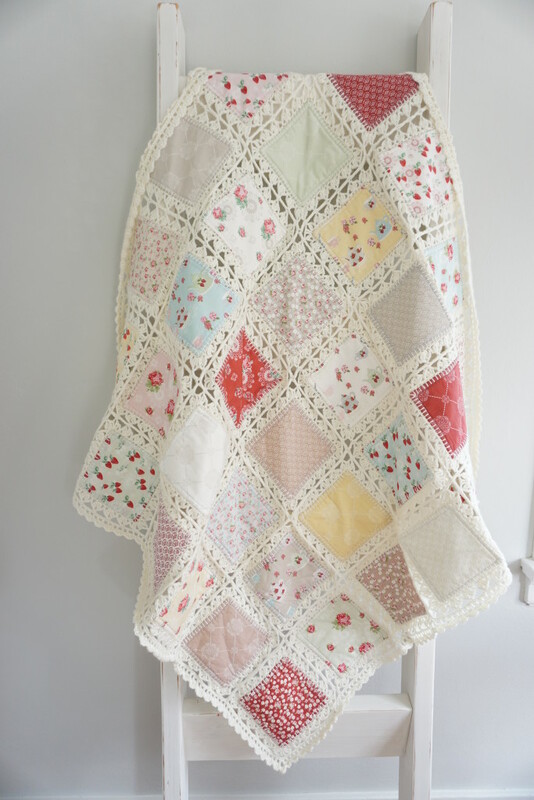 I love this and both sew and crochet so I will head over to the tutorial. I am eagerly awaiting your new line. 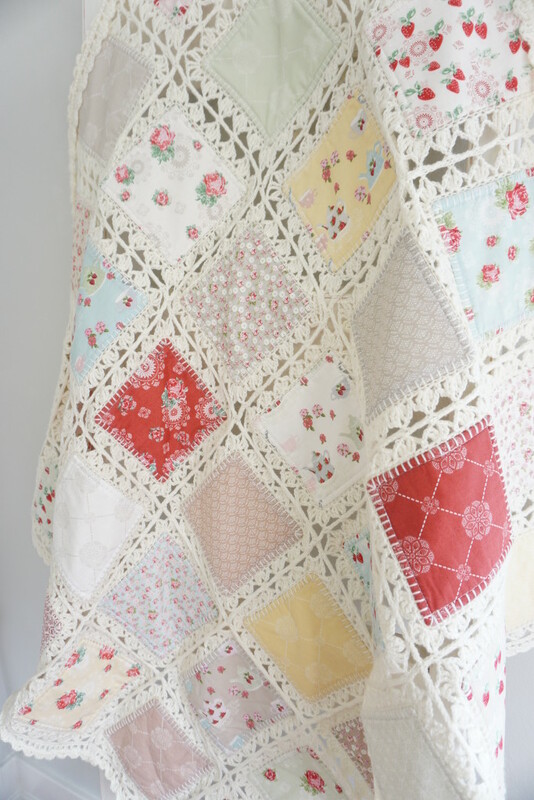 Most of the newer lines are a little brighter than I like and your colors, at least online, look closer to Tanya Whelans colors from a few years back/vintage Laura Ashley. I am honestly excited and, as a person who does not usually get much of a thrill out of spending money, that is saying something! This fabric line combined with crocheting was a match made in heaven. I watched the tutorial but will have to re-watch because I need to learn that crocheting. Also, waiting on the final blocking tutorial. Love it – it’s so sweet and thank you both for sharing! The lacey look is perfect with your fabric line too! I just may try to make one. 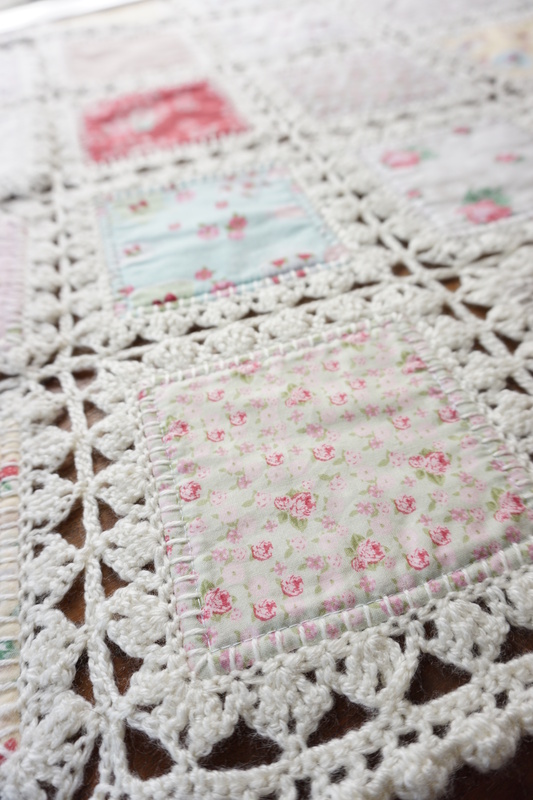 Love the combo of crocheting and your new High Tea collection! Will be on my Need To Do This! list! Would love to try this but can not get in to the tutorial. We are having an after noon tea for Marie Curie nurses for cancer patients and would love to show it of as it is so beautiful many thanks. This has to be one of the prettiest things I have seen in a long time. What a great idea! Thanks for sharing and I too will check out the blog, even though I don’t quilt I may have to find a way to do something similar… Love it! Where can I get the entire pattern? Would love to make this for my Granddaughter going off to college. Thanks! Love it! 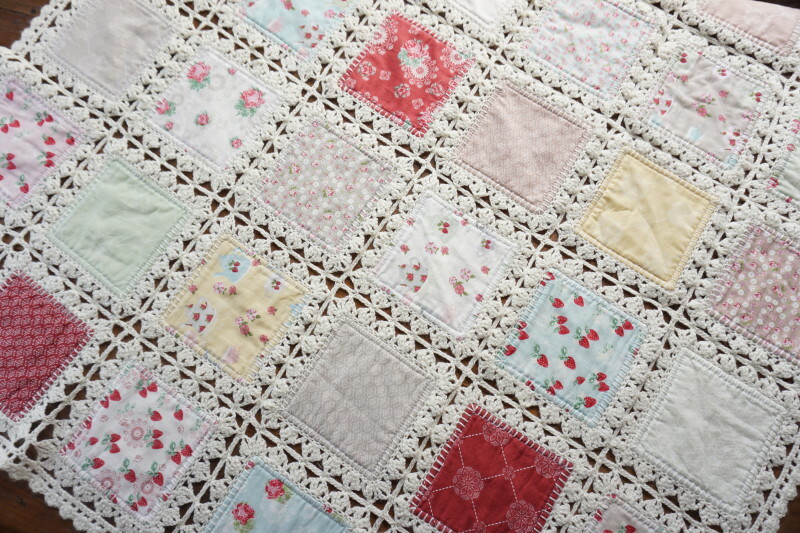 the High Tea Crochet quilt pattern has been updated to include the finishing instructions. It should be complete now. Thanks so much for your patience! I really like this quilt!!! Thanks for the tutorials. I am working on a quilt right now. Do you have idea when you will have the rest of the tutorials published? This is Georgeous! 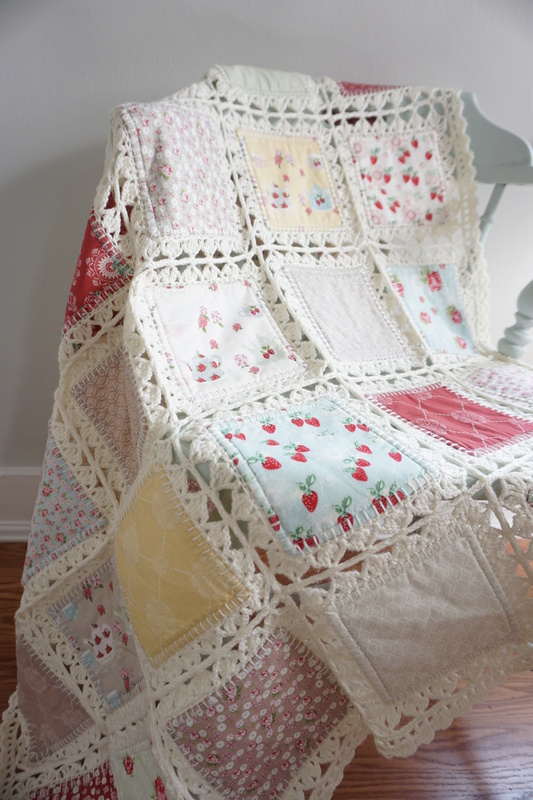 As a crafter who enjoys doing both fabric and yarn arts, I can really appreciate what went into this beautiful quilt! Wow! It’s beautiful and amazing! I will definitely be looking for your new High Tea line at my LQS and LYS, Keepsake Cottage and Yarn of Eden in Country Village! Congratulations! Absolutely stunning! I love this. Looking forward to 4 & 5 tutorials. Love the way it all was put together and love the material. I have some interesting “scraps” all ready made into 6 inch squares, along with batting cut to size and the yarn. I need to practice first on my crocheting as I am a lefty. Thank you so much for sharing this magnificent quilt with us. Would love to see the remaining tutorials. Hi cow, it’s a combo of 2 fabulous things! Super quilt and fabric. 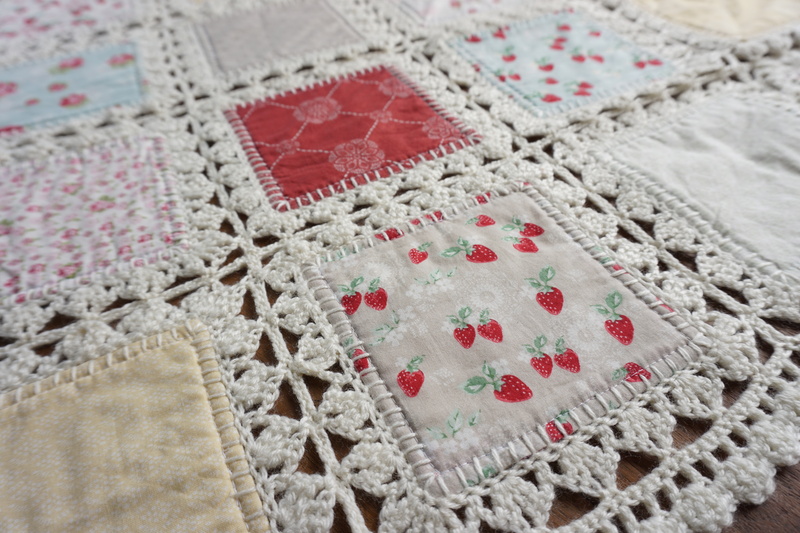 I love the idea of combibibg quilting with crochet: brilliant! This is so pretty, would love to make one too!!! never seen this combination of quilt and crochet before, but it looks amazing!!! Thank you for sharing!! you have an amazing blog!! Thank you very much for the kind comment! 🙂 happy quilting! Beautiful. Can’t wait to go over and take a look at the tutorials. I must find the time. This is fantastic. I’ve just bought the fabric to make a queen bed sized one. Wish me luck. Sue, did you just figure out the sizing on your own? Could you use a machine blanket stitch? I would like to make this for my granddaughter who has a single bed, so I would need it larger has anybody made this pattern to fit a single bed and if so could you share your sizing for me. Thank you so much. This would be first time making a blanket like this one, but it looks simple enough. ¡¡¡¡¡ ADORABLE TRABAJO !!!!! Felicitaciones. Tiene manos de artista muy sensible, inteligente, creativa. Where can you buy your fabric in a bundle? This is the most gorgeous blanket I’ve ever seen! When I try to go to the Fanny Lu Designs web page for the tutorial, Norton tells me it is NOT SAFE! Lovely! Where is the pattern? I wish you would sell them! They are so amazing!